Sometimes, finding a new best friend can change everything for the better. This week, the non-profit 4 Paws for Ability, which pairs special needs children with service animals, shared the touching account of one mother who knows that first hand. 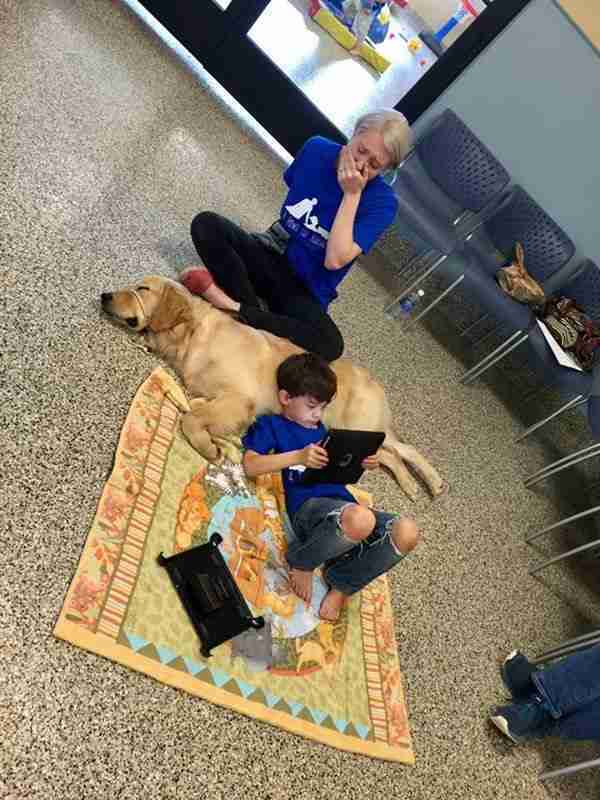 Her 5-year-old son, who has autism, was recently introduced to his new service dog, Tornado - and the effect was, in a word, profound. "See this moment?" wrote Shanna Niehaus. "I've never experienced a moment like this." Niehaus's son had just been paired with Tornado to provide him with a companion with whom he could share the world as he experiences it, in a way that few others could. The photo above was captured shortly after their first meeting - and their connection was immediate. This picture captures the face of a mother who saw her child, who she can't hug, wash, dress, snuggle and touch freely lay on his new Service dog of his own free will, with a purposeful unspoken attachment. This is the face of a mom who has seen her son experience countless failed social interactions on the playground in an attempt to have a friend. Any friend. Any kind of connection. She has sat with her son while he has cried at night for months because he has no consistent connections outside of the family no matter how hard he tries and no matter what he works hard on in his Autism therapies. It doesn't transfer to the natural occurring world for him. And now she is sitting behind her son silently watching this moment, with the air sucked from her lungs, and no words to say. Holding her mouth and silently crying because she doesn't want to distract him from the moment and break him away from a pure, honest, and truly fulfilling moment for her son-of his own free will. This is truly magic. Words cannot explain it. I have cried so many times for this boy, but this is the very first time I have cried for a reason like this. Perhaps never before has the life-changing love and understanding of a service dog been described so movingly. To learn more about 4 Paws For Ability, and to find out how you can help facilitate more pairings like this one, visit the group's website here.